Our crêpes dough suits perfectly both sweet and salted alternatives. The menu is seasonally adapted to offer ever-changing recipes and flavors to all food lovers in Stavanger area. For those of you who are not in the mood for a crêpe, nothing tastes better than a fresh French style sandwich filled with delicious ingredients. Bon appétit! We are a group of friends who have traveled to many countries in the world and it has become our tradition to taste every crêpes we came across. 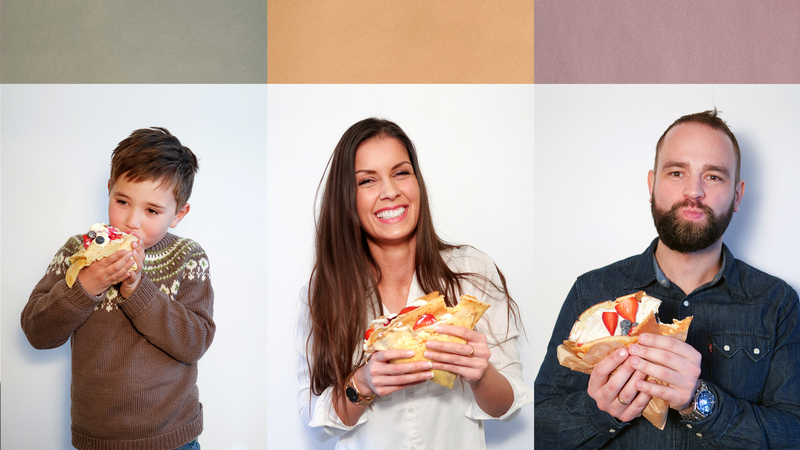 Beside passion for traveling we also share love for preparing crêpes and curiosity to discover and explore a huge variety of flavors to bring you the most delicious crêpes possible. We have been living in Stavanger many years and we came with the idea of having our own little Crêperie Take Away. We wish for everyone to experience a bit of France and a real taste of French crêpes. All our products are natural and handmade from start to finish and prepared fresh daily. We care about high-quality ingredients, so we naturally mostly use organic products. In addition, we strive to work with seasonal and regional products as much as possible and do not use any preservatives or food colourings. For caterings and other inquiries, please get in touch via e-mail. We also offer vegan cakes, cookies & other baked goods as wholesale for other cafés.